There’s no doubt that leggy beauty Deepika Padukone has an enviable figure. To maintain a body like that, Deepika must be working hard and sweating it out in the gym. But you will be surprised to know that the ‘Om Shanti Om’ actress is always hungry! Don’t believe us? Well, the actress has herself confessed to being ‘forever hungry’. These two are so adorable and we totally love their social media PDA. 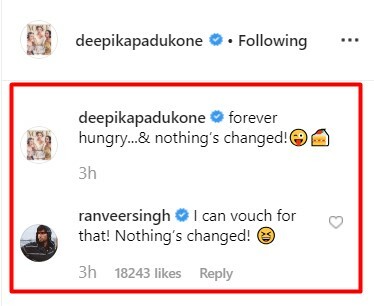 On the work front, Deepika is busy with Meghna Gulzar’s ‘Chhapaak’ whereas Ranveer was prepping for Kabir Khan’s ’83’ in Himachal Pradesh. He returned to Mumbai today. Stay tuned for more such interesting updates.